He Qinai,a Naxi with serious physicall problem, Born in 1979.When she was born , her whole family was full of happiness and hope. The family allready had a boy, now with a birth of a girl, so the family woul have both Dragon(son) and phonix(daughter).The parents love her so much then named her Qinai(qinai means diligent love). 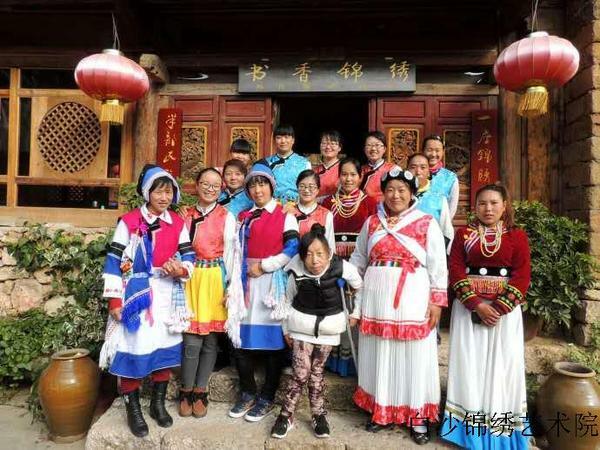 With two children, the time was really flying, three years pasted very soon.And He Qinai got sick suddenly one day, her parents took her to the only doctor in the village.A fter taking some medecin she was fine. But since then, with time going on her backbone curved and seems she was almost not growing. 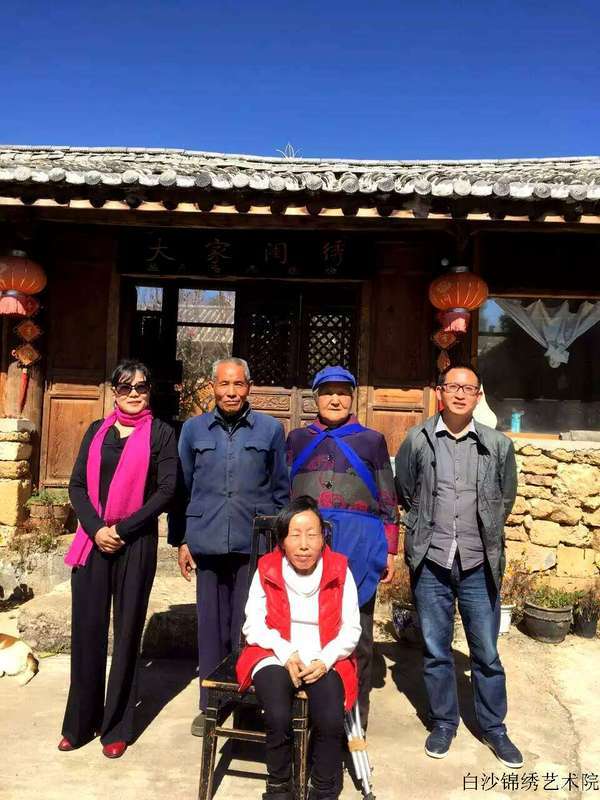 She was taken to the best hospital in Lijiang when her parents realise her problem, but the doctors could help nothing but telling to take care her well. Here parents never gave up, sent her to school, took her to the places where normal children could go.But she really got more and more serious, and lastly had to stop school after elementary school. And have to walk with the walking sticks or by the help of somebody. He Qinai was taught to be undependent and to make handcrafts by her parents. She was possitive all the time with the encouragement of her parents.When her elder brother married, it seems she became a trouble in the family , so her sister-in-law did not like her so much. Then her parents splited the family into two and live with her.She was encouraged to work in different crafts factories, but she was fired even she worked very hard and did good job,because they worried her health(she may fall in any places unaccompanied). 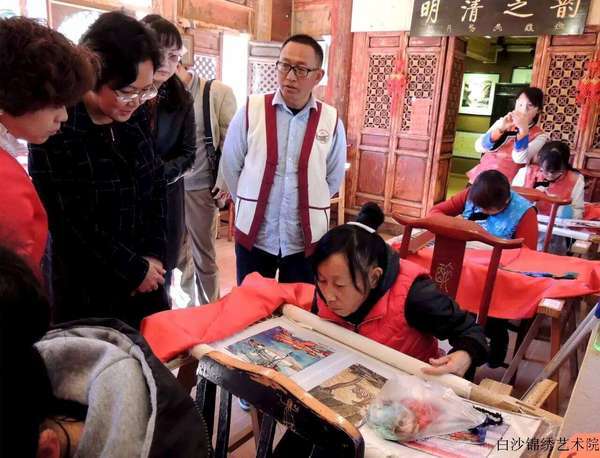 When she heard about Baisha Naxi Embroidery Institute, she repuired her father and uncle to took her to check the details for her.She was talken to the institute by her parents and her uncle(her uncle have a simple car). When she saw the classrooms and the finished embroidery works in the exhibition room, she said i had dreamd many times to study and work in this kind of place. The institute acccepted her and provided free tuition,dormitory and food for her.She was arranged to be helped by classmates in turn.She studied much harder than any other classmates and did very good embroidery.And learnd how to finish a designed work well undependently in 3 months. "The God closed one gate and opened another window for her", she is the best student in her class. 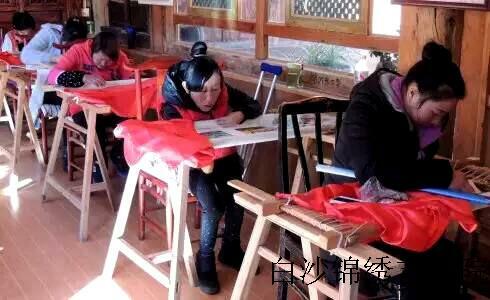 She was encoraged to embroider at home with the good care of her parents after graduate. The institute provides free material for her and collect her works with higher prices.By this way she could get a good income and surpport her life well.Each time when she came back to the institute with her nes works accopanied by her father and uncle, the teachers and students were all moved by her spirit,wonderful works and the great father.She also find her value and confidence with embroidery in Baisha Naxi Embroidery Institute.where there is a will, there is a way !